Wow, it's been a busy first week! My summer reserach experience started with a SURI orientation, and then I got to work! Sam, Helen, Michelle W. and I talked about the project and some of the introducotry reading material. Michelle and I received our first assignment to compare four different survey instruments to help decide which one to use for PEARS. I had the chance to experiment specifically with Qualtrics and make surveys to see what kinds of questions are possible, which was fun! Once we finished our IRB training, we got to learn how to code interviews. Sam guided us through the process as we coded some interviews together. We are looking at what skills and knowledge the interviewees thought were important for engineers to have, which ones they thought they have, and how they learned these skills. It was actually very entertaining to read these interviews and see the wide range of responses. We began the process of grouping, but I will be doing much more of that next week. Already, some interesting patterns are emerging, so I am excited to continue this work. The third component of our work is working on this ePortfolio! Helen introduced the platform, and we talked about possibe things to include. I am glad to have the opportunity to organize everything into this portfolio for future use because I definitely think it will be useful both for keeping myself organized and to be able to show to other people like potential employers. I had the opportunity to attend two PhD defenses. I found them interesting, because up until this point, I realized I had very little idea of what getting a PhD truly involved. The work that these students did was also very interesting, because I had previously not at all considered the possibility of reserach in how people learn engineering. I am finding myself more and more interested in this field, so I am super glad to have the opportunity to do this summer research! We also had several meetings. There was a Design X meeting with all the other SURI students working in CDR, which was nice to be able to meet some of our fellow reserachers. I also met Mark and Elizabeth, who are working on a project to develop a robotics curriculum for middle school students and were looking for anyone who happened to have experience in it. I happen to have been teaching LEGO robotics to middle schoolers and mentoring FIRST Lego League robotics teams for the past four years (please see my Volunteer Work for more about that), so I am really excited to be able to share my experiences and help them! We also had a PEARS team meeting, which left me puzzling over the question, "What is engineering?" Michelle and I are planning to investigate this, using other information from the interviews and seeing what we find. I am currently planning to be an engineer, but I realized I don't really know what that means! bowling! 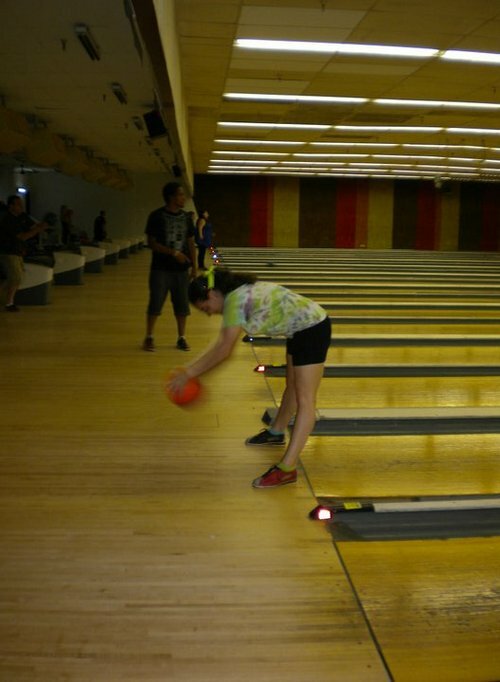 As you can see in the picture below, I specialize in backward-between-the-legs bowling. I had wushu practice, where I got to start learning the intermediate broadsword set, which is exciting! But most exciting of all was that Thursday night was our first gymnastics practice! A couple girls and I are trying to start a women's club gymnastics team, and we officially have gym time 6 hours a week! Having a three-hour practice made me realize both how out of gymnastics shape I am, but also just how much I have missed it, so I am so happy to be back!